Amid the recent decisions to not indict police officers for the terrible deaths of Michael Brown and Eric Garner, we face a week fraught with memory. We face how a nation’s history created a world in which a white cop chokes a man to death and does not go to jail while a black rapper sits in jail facing a life in prison for having a gun on his album cover. A specific officer was not indicted, but our history must be. This week felt important. As I looked back at this week in history, some stories stood out to me. Some moments rang louder, sharper and more poignant. Next week, like all weeks, will inevitably be filled with loss and joy, birth and death. But it’s the feeling, the determination, the conversations and the sleepless nights that will turn into notches on a timeline and shape the stories we tell. There wasn’t a massive pavilion, and there wasn’t thrill in the air. It was Dec. 1, 1862, and it was due time for reflection. Abraham Lincoln read aloud while a clerk transcribed what would become the traditional State of the Union address. He spoke at length about the Civil War that had torn the nation apart. To Lincoln, a permanently divided nation was unfathomable. He compared the separation to a divorced couple forced to live next door to each other. Determined to keep the country together, Lincoln calculated the only solution was to free the slaves. The plan was highly economical. He assured southern states and slave owners they would receive monetary compensation and the transition would be gradual. It was a country founded on justice for white, Protestant, slave-owning men. The more things change, the more they stay the same. The year was 1955. Exactly 93 years had passed since Lincoln laid out the justification for emancipation. A short period of reconstruction followed, but the Supreme Court quickly ruled constitutional the “separate but equal” laws. Jim Crow slithered through the south. Founded in 1909, the National Associated for the Advancement of Colored People, or NAACP, fought decades of legal and political battles until the Supreme Court declared segregation in schools illegal in May of 1954. The following year, Rosa Parks knew something had to change. She lived in a country where rights for her people were a begrudging afterthought to the Constitution. Her city of Montgomery, Alabama, once the capital of the Confederacy, remained separate but not equal. Parks was secretary of the local NAACP and a seamstress by trade. Her impeccable record and respected position in the community made her ideal for a test case against segregation law. On Dec. 1, after getting off work, Parks boarded a bus in downtown Montgomery and sat down in the first empty seat in the colored section. As the bus started to fill up, a white man asked her to get up so he could take her seat. Parks refused and remained seated. The bus driver called for her arrest. It was on assignment for Harper’s Magazine that James Baldwin, a black writer from New York, first set foot in Montgomery. On Dec. 1, 1987, Baldwin died. The grandson of a slave, he left us his words, forever to be interpreted, a life shaped by conflicting identities and a struggle for freedom. “If it were white people being murdered, the Government would find some way of doing something about it,” wrote Baldwin in the New York Times in 1965. It was summer 1964, and something had to change. Whites had always found a way to block the black vote, and the continuing harassment, violence, threats and intimidation instilled a deep fear in black southerners attempting to register. But the Student Nonviolent Coordinating Committee, or SNCC, had a plan. They organized the Mississippi Summer Project, setting up freedom schools in the south to teach children about civil rights and advocate blacks’ voter registration. Mario Savio, a student from UC Berkeley, was one of the hundreds of college students SNCC recruited from the north to volunteer. After experiencing first hand the terror and violence at the heart of the oppression in the south, Savio returned to Berkeley with the intent of raising funds for SNCC. But the university had put a ban on all political activism and fundraising. On Dec. 2, 1964, Savio spoke out to a crowd of thousands on the UC Berkeley campus. To fight for civil rights, he needed to fight for a voice. The following day, thousands of students packed into Sproul Hall to protest the free speech restrictions the university had in place. That night, 800 protesters were arrested. It was the largest mass arrest in the state’s history. Exactly 50 years later, a different case caught the nation’s eye, calling to question once again the origins of our Constitution and our concept of law and order. On Dec. 3, 2014, a Staten Island grand jury decided not to indict Daniel Pantaleo, a white police office who held Eric Garner in a chokehold as he died. The only crime of Garner, an unarmed 43-year-old black man, was allegedly selling loose cigarettes and being a 43-year-old black man in America. #EricGarner and #ICantBreathe immediately filled the cloud. 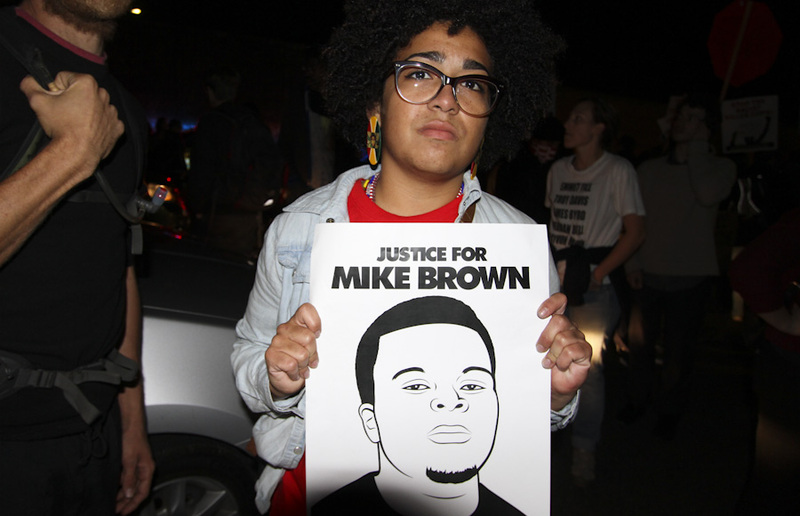 The decision came a little more than a week after a grand jury in Ferguson, Missouri, voted to not indict white police officer Darren Wilson, who shot and killed unarmed 18-year-old Michael Brown. Thousands protested. They shut down freeways and bridges. They shut down BART in Oakland. “There’s a time when the operation of the machine becomes so odious, makes you so sick at heart, that you can’t take part!” shouted Savio in 1964. Fifty years later, the machine was still running, written into the conscious and unconscious minds of citizens, in the war on poverty, the war on drugs, the war on terror, the crowded prisons, the housing restrictions, the reminder that all lives matter, just in this country, some not as much. Fred Hampton was a voice for the voiceless from a young age. Born in 1948, he grew up in a working class suburb of Illinois. At 19 he became the president of the local youth council for the NAACP. By the age of 20, he joined forces with Bobby Rush to start the Chicago chapter of the Black Panther Party. “We Want An Immediate End To Police Brutality And Murder Of Black People,” read point seven of the Panther’s Ten-Point program. Founded in Oakland as a defense against police brutality, the Panthers’ vision quickly caught the imagination of communities around the country. The Panthers set up free breakfast for children programs, medical services, ambulance services and transportation services to take families to visit loved ones in prison. If the United States wouldn’t treat them like citizens, they would determine their own destiny. President Nixon ordered head of the FBI, J. Edgar Hoover, to eliminate the Black Panther Party at all costs. In Chicago, police repeatedly arrested Panthers and violently raided their offices. The targeted violence was no surprise. A black person living in Chicago in 1969 was six times more likely to be killed by the police than a white person. At 4:30 a.m. on Dec. 4, 1968, police armed with heavy weaponry raided Hampton’s apartment. Police shot Hampton twice in the head, killed Panther leader Mark Clark and wounded seven other Panther members who were in the apartment. Police claimed an informant had notified them of a stash of weapons in the apartment, and when they entered, Panthers had shot at them. Hampton and Clark were the 27th and 28th Panthers to be killed by police since January 1968. After much pressure from both conservative and liberal black political organizations, a federal grand jury investigated the killings. They found Hampton had been murdered in his sleep. The state attorney dropped charges against the seven Panthers who were arrested in the raid, and the report showed the officers had fired at least 82 bullets, while a Panther fired only one shot. On the same day in 1969, Shawn Corey Carter was born in Bed-Stuy, Brooklyn, the fourth and youngest child of Gloria Carter. His father left when he was 11, and when he was 12 he got a gun and shot his brother in the arm. He later became involved dealing cocaine. In 1994, he was shot at point-blank by a rival distributor. He decided to try making money selling music. Under the moniker Jay-Z, Carter released Reasonable Doubt in 1996. Jay-Z became one of the most financially successful hip-hop artists of all time and married a divinely celebrated singer named Beyonce. His story is a success story to a colorblind America — one in which a black president gives whites the power to neglect race as a function of success. Just take it from Jay-Z’s neighbor, comedian Chris Rock. “The black man gotta fly to get something the white man can walk to,” Rock said at a comedy show. According to Rock, the only other two black people who live in their expensive New Jersey neighborhood are Mary J. Blige and Eddie Murphy. Rosa Parks was arrested and found guilty. Local civil rights leaders met to plan a citywide bus boycott for the following Monday, the day of Park’s trial. They decided to elect a young pastor to lead the boycott. He had just moved to Montgomery and didn’t have any enemies in the community. He was bright and full of ambition. His name was Martin Luther King, Jr.
Jo Ann Robinson, a member of the Women’s Political Council, stayed up all night copying 35,000 fliers to promote the boycott. Word spread rapidly throughout Montgomery. Thousands of voices calling for justice have the power to halt a machine. On Monday, Dec. 5, empty buses drove through the city. The community came together that evening to discuss whether the boycott should continue. King was notified shortly before the meeting that he should give a speech. More than 10,000 blacks gathered to hear what the 26-year-old pastor had to say. King’s speech lit a fire in the crowd. A resolution was read asking that all African Americans boycott the bus system until a settlement could be negotiated with city officials. The answer was a unanimous yes. The Montgomery Bus Boycott lasted 381 days, but it was not easy. The community organized a complex system with thousands of cars to transport blacks around the city, all while facing violent oppression from the KKK and racist whites in Montgomery. It was a 1955 social justice Uber. But they were determined to make change, and a little more than a year later, the Supreme Court ruled segregation of the Montgomery buses unconstitutional. Martin Luther King Jr. had been launched into the national spotlight, a product of a woman’s commitment to be treated like a human and a community’s decision to turn a week of activism into a movement.